The second largest teachers’ union in America is striking in Los Angeles right now. One of the famous faces on the picket line is Steven Van Zandt a.k.a. 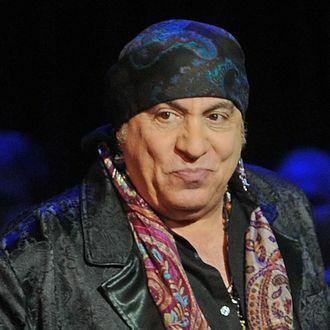 Little Steven, he of the Underground Garage. Van Zandt penned an op-ed for Rolling Stone about why the UTLA strike is important to him, and what the heck he was doing on the picket line in the first place. “This celebrity thing is really only good for a couple of things,” he wrote. “You can get into a restaurant, and you can do something that’s actually usable.” Van Zandt has been working with teachers organizations across the country with his organization, TeachRock. “We just finished a tour [the Teacher Solidarity Tour, with free tickets for educators] and everywhere we went, there were teachers on strike — West Virginia, Kentucky, Arizona, Oklahoma. Teachers are right there on the front line fighting against ignorance, and, boy, do we need that right now.” In Los Angeles, UTLA is striking for smaller class sizes, a nurse and psychologist for every school, and accountability for charter schools. Today was the first day of negotiations between the union on LAUSD.